Have you seen the new series that PatternReview.com launched this month on its blog? It’s called PatternReview Celebrates Indie Pattern Designers. Each month they will feature an independent pattern company and will run a contest featuring prizes from that company. We’re flattered that PatternReview has selected our brand-new Liesl + Co. patterns for women for its inaugural contest. You can find all the details and learn how you can sew along for your chance to win on the PatternReview blog. Good luck! And that’s not all. 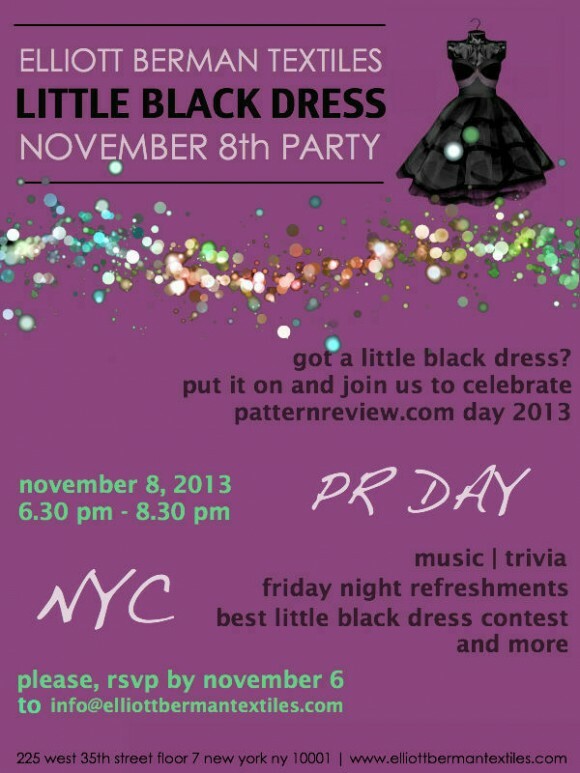 On November 8, Elliott Berman Textiles here in New York is hosting the Little Black Dress Party to celebrate PatternReview’s 12th Anniversary and you’re invited! Join Deepika from PatternReview (who will be traveling in for the event!) and other PatternReview members from the New York area for the evening. Liesl is planning to attend, so join the fun and stop by to say hi if you’re in the area. I, on the other hand, am a little self-conscious about wearing my favorite little black dress outside the privacy of my own home, so I’ll be staying home with S. Unless, of course, this post gets inundated with comments telling me how great you imagine I look in a little black dress. In that case, I may just have to reconsider. No idea if you’d look good, but I’d certainly pay to see it, if only for the laughs. Pity I’m on the other side of the world. Photos please! Like Shelley, I’d pay good money to see that too! C’mon you have an audience now. Todd, I’m sure you would look smashing in a LBD!